I imagine it is clear that this month’s newsletter is a “Native Plant” extravaganza. This article corresponds to the NAL Position Paper on native plants that is featured in this newsletter – go to Robin and Cynthia’s offering to learn WHY to plant natives. The extra articles shown on the NAL page under the Native Plants heading make a lot clear! And this month’s Horti Toity letter suggests a few alternative native species that you should plant instead of some EVIL but commonly used nonnative invasive plants. To dip further into this subject, there is a marvelous and very easy-to-read book called Bringing Nature Home by Doug Tallamy. Everyone in the SLGC should read it! October is a great month to plant perennials and shrubs to enjoy next year, especially those that bloom in spring. Get their roots in the ground now, while the soil remains warm, giving root growth a chance to catch hold before the soil freezes. ** LEARNING OPPORTUNITY** We all tend to plant in spring, when the catalogs have piled up all winter and we have been seduced by many too many wonderful photos, but spring soil is often cold and water-saturated. Fall is in general a better planting season for perennials, and for the majority of shrubs and non-spring-blooming trees. Why native plants? There are many, many reasons. Let’s start from the gardener’s point of view with the fact that natives have evolved to live in our soil, in our climate, and with our light and seasons. That means they are proven hardy in our garden conditions here, which in turn means they are reliable. Change your hat and consider them as a conservationist might. Native plants are necessary to life on earth, including human life. Change hats and be an ecologist for a moment. Native plants have co-evolved with our native wildlife; they have a logical role in the food chain. Their fruits, nuts, foliage, and nectar feed insects eaten by our food animals and also feed those animals themselves (deer in the garden, anyone?). These are three simple reasons for using native plants in our gardens; there are plenty more. I refer you to Doug Tallamy, or, if you prefer a personal approach, I am always happy to lecture you myself. Now, here are five great ideas for native perennial plants to add to your garden now, for your enjoyment next spring and summer and for many years to come. 1. 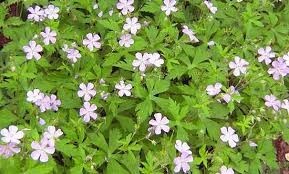 Geranium maculatum is a sun to part shade lover native to our area. It blooms from April until June, displaying soft pink-to-lilac, very showy blossoms that bring bouquets of sweet color to the edges of your woodland gardens. The foliage is deeply cut in a clean green, occasionally spotted with yellow, and the entire plant is deer- and rabbit-resistant: Hurrah! Typically the plant is about 18” tall by 18” wide, although in full sun it may grow taller. Once established, it can tolerate quite poor and dry soils. **LEARNING OPPORTUNITY** You will often see the words “once established” when plants are described. What this means is that you should baby new transplants for the first year or two, watering them more often than you might need to in the long run, and perhaps mulch them more carefully in their first season. Almost no plants except invasive nonnatives will survive transplantation without a little help at first. But once this baby is established, she is rock-solid and iron-tough. She will love you forever, and I guarantee you will love her back. 2. Packera aurea (syn. Senecio aureus) **LEARNING OPPORTUNITY** You will often see two different botanical Latin names listed for the same plant. This is not in fact just a mean trick being played on you by horticulture experts. This means that recent research has discovered that the plant was originally misidentified as belonging to one plant genus but has now been reassigned. Sometimes an entire new genus will be named, as, for example, many of our Asters have recently become Symphiotrichon, but not all of them. Go with the flow – this is much easier with the internet to help guide us than it used to be. Anyway, Packera aurea blooms from mid April until mid May here, and it is very very sunshiny bright –and, oh by the way, a member of the Asteraceae, the overarching Aster family that includes, now, so many more genera than it used to. In bloom, the plant grows to about 2 ½’ tall, but after the bloom finishes the plant dies back to a 6” or so tall ground cover mat. Natural habitat for this plant is in moist-to-wet locations, so you might give it a little extra water for the first year or so if you are growing it in a typical garden soil, in any light from full sun through almost full shade. If you have a rain garden, or a spot that is often wet near a downspout, here is a showy, dependable spring bloomer for you! 3. Liatris spicata is one of many species of Liatris native to our part of the world. Unlike the prior two plants, it is typically a full sun meadow or prairie variety, although it is not a devotee of dry soil. It has many common names, including Gayfeather and Blazing Star. **LEARNING OPPORTUNITY** Never rely on a common name to find you the right plant, although it may help guide you there. 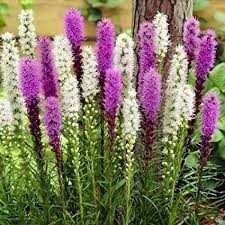 If you look for Gayfeather, you might find a much smaller plant, one of a different color, one far less hardy – all of which are Liatris species, but not this choice one. Liatris spicata, once established (get that – not the first year) creates a cluster of straight tall spikes, 2’ to 4’ tall, which terminate in a 1’ long burst of ray flowers of a rosy purple color. Can we say “Showy”? You bet! The bloom is typically July into August, and the flowers that encircle the spikes are usually swarming with butterflies (check out that article about why to grow native plants – to feed the native pollinators). The photo shown here is of two slightly shorter cultivars of this species, L. spicata ‘Kobold’ and L. spicata ‘Floristan White’. Our native pollinators tend to be better fed by straight species (see the next plant suggestion), but sometimes Liatris spicata can be hard to find in the trade in its straight species option. When you can find it, buy the straight species! 4. Monarda didyma is one of a number of Monarda species that are native to NE Ohio. Like many of its cultivars, it is known as Scarlet Beebalm. It is indeed scarlet – like a firetruck – and it blooms for us in July into August. It grows 2’ to 4’ tall (usually about 3’ unless you baby it, and it doesn’t need babying; it’s iron-clad strong once established -- AHA! A theme!). Like its friend the earlier blooming Packera, it is bright and showy and would love to have its feet stay moist all summer – rain gardens and downspouts! It is not favored by deer or rabbits, but is very favored by hummingbirds and butterflies. **LEARNING OPPORTUNITY** You will always find butterflies and hummingbirds feeding on the nectar of Monarda didyma. If you plant across the border from it the common cultivar Monarda didyma ‘Cambridge Scarlet’ you will NOT see the cultivar mobbed to the same extent – might be the scent, might be a small difference in the blossom architecture. Cultivars in non-scarlet colors are even less visited, because the pollinators do not recognize the plants that are lavender or white or whatever. There is a fascinating paper on the recent cultivars published by the Mt. Cuba Center, and if you are considering planting Monarda you should heed its advice, especially about disease-resistance. The straight native species are FAR more disease-resistant. Another value of Native Species! (Personally, I have chosen to plant the native Monarda fistulosa – I prefer its softer color). 5. Coreopsis verticillata, or Threadleaf Coreopsis, is one of many species of Coreopsis that is native to Ohio, but this one offers a great **LEARNING OPPORTUNITY**. New cultivars (cross breeds, typically) of our Native Plants are developed all over the world for various reasons: to offer new ranges of colors, to alter the flower structure of the plant’s bloom, to make dwarf versions or larger versions of the standard plant, and so on. Sometimes breeders aim to improve a plant’s resilience to climate, but this is rare (notable exception – Holden Forests and gardens has a major Azalea breeding program to bring us hardier, healthier species here). Sadly a typical side result of breeding to change a plant’s characteristics is often to lessen the plant’s resiliency. In recent years, breeders have embarked on creating vast numbers of “new” Threadleaf Coreopsis, in unlikely but beautiful colorways – and most of them do not live more than two years in our NE Ohio gardens. The straight species is a rock solid, dependable spreader, a magnificent 2’-2 ½’ tall plant with delicate foliage and bright yellow daisy-like blooms, in color from June through September. Most of the new cultivars, many of which are lovely in bloom, “melt” away in the garden after a year or two, and their bloom seasons are far shorter. I have used a couple of the new ones in spaces where I wanted their look, but they are expensive to replace regularly, and, frankly, I am removing all but C. v. ‘Zagreb’, which is an old dependable, very similar to the straight species. If I could locate the straight species in quantity, however, I would even abandon my old favorite ‘Zagreb’. If you can find the species, go for it! This is a workhorse of a plant!